German Potato Dumplings are a wonderful side dish idea, mostly served with delicious meals such as Beef Goulash, Sauerbraten and red cabbage with apple. 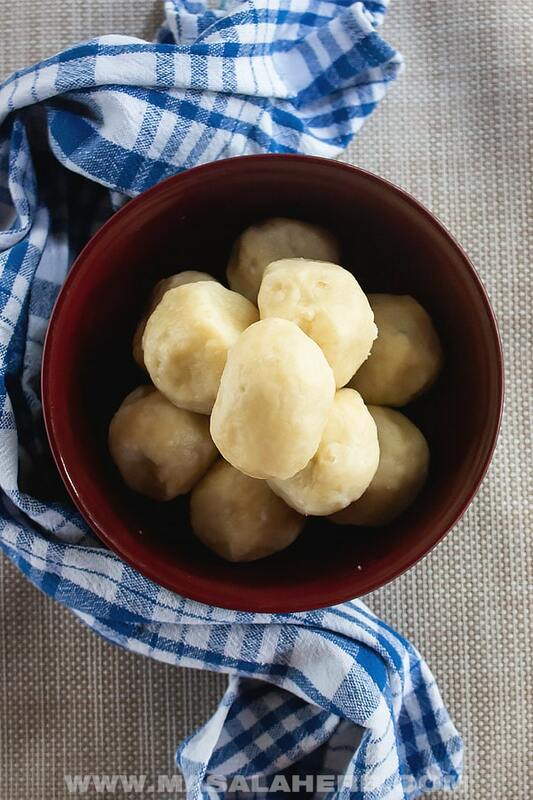 Potato Dumplings, aka Kartoffelknödel in German, are easy to prepare. Watch my quick how to make potato dumplings video further below! 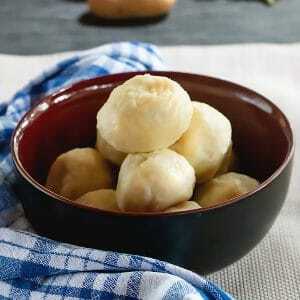 The German Potato Dumplings are common round dumplings prepared with a potato dough. The dumplings are served as a savory side dish in all the German-speaking countries such as Germany, Austria, and Switzerland. Neighboring countries and former countries from the empire, such as South Tyrol (North Italy) and Slovenia count these potato dumplings to their traditional food. Potato Gnocchi from Italy resemble the German Potato Dumplings. 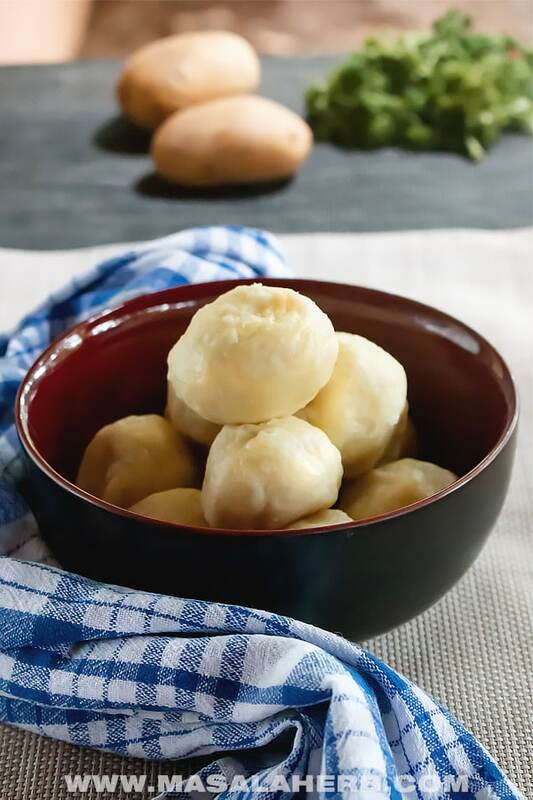 In fact, the potato dough is quite a popular dough variety in central Europe and other dumplings and noodles are prepared with this dough as well. How are Potato dumplings called in German? Potato Dumplings are known as Kartoffelknödel or Kartoffelkloß in most parts of Germany. In Austrian we call the Erdäpfelknödel, in Bavaria the potato dumplings are known as Reibeknödel. The word for dumpling in German is “Knödel/Knoedel or Kloß/Kloss”. In North Germany, they will say Kloß and in the southern regions Knödel. The Potato is known as Kartoffel in German. In Austria and Bavaria potatoes are called Erdäpfel (literal translation Earth apple). How to make German Potato Dumplings? To prepare the potato dumplings you will need to follow simple steps. First, the boiled potatoes are peeled and mashed. Then all the ingredients are mixed together into a firm sticky dough. Next, the dough is formed into dumplings. At the same time, salt water is kept for boiling. Once the water is boiling, place your round potato dumplings into the water. Let them boil and take them out when you see them swimming on top. That’s all there is to it. Cooking German potato dumplings is rather easy. How to store potato dumplings? 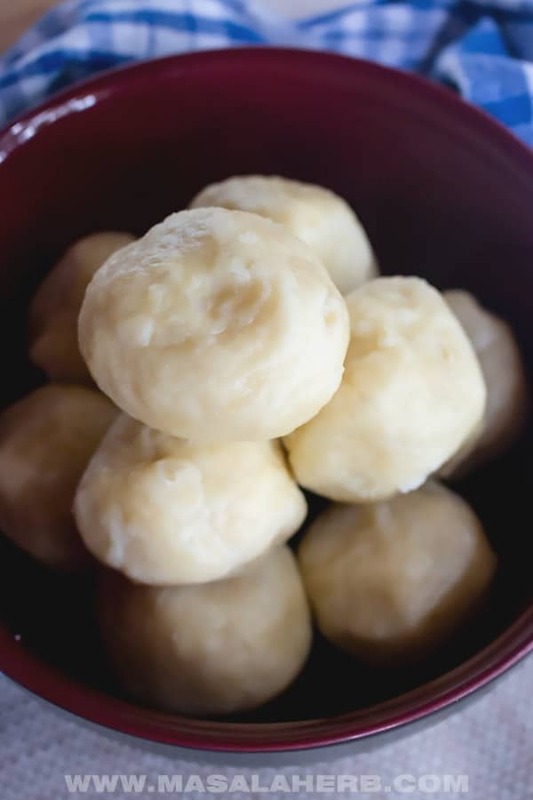 If you plan on eating the potato dumplings within 48 hours, prepare the dough and store it in the fridge until you get time to boil and eat them. I think the dumplings taste better when freshly boiled. You can boil the potato dumplings and keep in the fridge but then they tend to get chewy and hard. To store the German potato dumplings over a longer period of time freeze them. Prepare the dough, form the dumplings, cook them and then wrap them in a clean wrap. Freeze the potato dumplings. To take the frozen dumplings out, defrost in room temperature water and cook them again so that they get hot. How to serve the Kartoffelknödel – Potato Dumplings? The savory potato dumplings are usually served with saucy/gravy rich meat meals such as Beef Goulash. Also, fall themed meals such as a venison dish as served with these potato dumplings. Here some more ideas. These German Potato Dumplings come together easily if you follow my steps. Watch my how-to video in the post for the visual instructions. The Potato dumplings are vegetarian. Place your peeled boiled potatoes in a bowl. Mash them. Add the all-purpose flour and corn flour to the potato mash. Season with a pinch of salt and finely scraped nutmeg. Make a slight well in the center and drop the egg into it. Add the butter too if you want your dumplings to turn out more smooth. Mix the potato dough ingredients and start to create a dough by forming it gradually. The end result should be a smooth dough. Keep a pot with salt water to boil. Now shape your dumplings by taking some from the dough and rolling it into a round form. It helps to roll the dumplings out with flour because they can get sticky. Use up al the dough. Once the water is cooking, drop your dumplings into the water. Make sure that they don't stick on the bottom of the pot. Gently move them. Let the dumplings cook uncovered until they swim to the top. Take the dumplings out when they swim on top of the pot. See for serving and storing suggestions in the post further above. You may or may not add butter. This is up to you. I think the dumplings turn out more smooth with the butter but if you want to cut on fats than you can skip the Tbs. The cornflour makes the dumplings more elastic and maybe a bit lighter. You can choose to skip the cornflour and use simply all-purpose flour only instead. Do not skip the nutmeg. You need the nutmeg in the dumplings for flavor. Calorie per servings is for one dumpling. Dear Reader, how and with what are you planning to serve the potato dumplings? 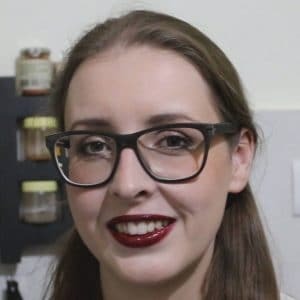 Hi, this may be interesting you: German Potato Dumplings Recipe!